Beuys’ iconic work Titus Andronicus / Iphigenie was created at a turning point in art history, when performance art was declaring its independence as a genre distinct from classical theater. Described as an “action event” originally enacted at the Frankfurt Theater am Turm for the 1969 Experimenta 3, his famous performance contrasts the violence and cruelty present in Shakespeare’s Titus Andronicus with the themes of redemption, love, and forgiveness found in Goethe’s Iphigenie auf Tauris. 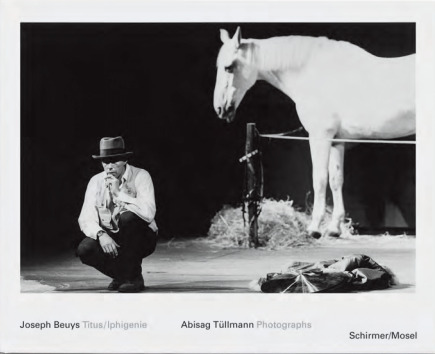 Beuys shared the stage with a white horse and golden cymbals. His actions—pacing back and forth, feeding sugar cubes to the horse, imitating the flight of birds, playing the cymbals—were accompanied by off-stage voices reciting texts from Titus Andronicus and Iphigenie. Award-winning theater photographer Abisag Tüllmann documented this legendary pioneering performance in 46 black-and-white photographs. It is the only complete documentation of the work. Schirmer/Mosel. With texts by Mario Kramer and Peter Handke. 120 pages, 46 duotone plates. Size: 30 x 24.3 cm, hardcover. English/German edition.